“Bialowieski”*** Hotel offers one apartment and 76 rooms (152 beds), with space (24 to 28 square meters) comparable to the standard of Swiss **** hotels. Each room, equipped with two beds may be used as a single one. Worth of recommendation (especially for families which travel with children) are our vast (28 square meters) rooms, to which we can add a detached bed. All rooms contain a bathroom, TV SAT, telephone, alarm clock and a radio, only few of them lack balconies. 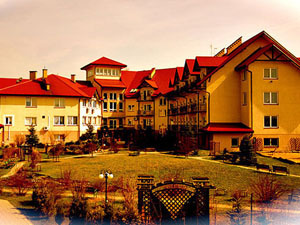 Please also visit the pension, beautifully situated upon the Narewka Valley only 150 m. away from the Hotel. The rooms, in addition to beautiful views, come with bathrooms and a kitchen. Additionally, they are equipped with balconies (majority), TV SAT, telephone, alarm clock, radio, internet. It is possible to arrange an additional detached bed in most of the rooms. accommodation with breakfast – prices in Euro 02.01. - 20.03. 01.11. - 23.12. 21.03. - 31.10. Price includes VAT and climate charge. Prices in Euro 02.01. - 20.03. Price includes a fine and varied breakfast, served in the form of Swedish buffet. Check-in from 3 p.m., check-out until 11 a.m.
extension of your stay to 5 p.m. (when available): 8 €/1 person. additional bed - 13 €/1 day. Price does not include breakfast. Fenced and supervised parking lot: for hotel guests, parking first hour for free, each following hour: 1€, one day of parking - 8€, bus - 25€/day, microbus - 15€/day. We offer discounts during group stays and longer individual stays.